CHECOTAH, Okla. – Much has changed since Riley Duvall’s first qualification to the National Finals Rodeo two years ago. That’s a good thing. Confidence is key for any athlete, especially those competing on the biggest stages of their sport. That’s the case for Duvall, whose father, Sam, qualified for the NFR in 1987 and ’88. The bulldogging legacy began with his great uncle, Roy, a three-time world champion who qualified for the NFR 24 times, including 21 straight from 1966-1986. Riley’s grandfather, Bill, was Roy’s hazer most years he competed at the finals. Riley’s uncle, Spud, was a two-time qualifier, and their cousin, Tom, has also played on ProRodeo’s biggest stage. But he understands the gamble that comes with the game. There are no guarantees in rodeo, and contestants must pay entry fees in order to compete. The only way they earn any money in the sport is by finishing better than most. This season, he pocketed $77,643. 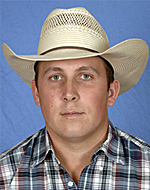 In a sport where dollars equal points, he heads to the NFR 12th in the world standings. Now, he has a chance to cash in big time at the world’s richest rodeo, featuring a purse of $10 million paid out over 10 December nights. Go-round winners will earn more than $26,000 each night. Two years ago, he earned just shy of $68,000. That’s how he makes his living. He travels the country wrestling steers in order to make ends meet and put food on his family’s table. There have been some lean times, and some came in the 2017 season. He finished the regular season No. 31 in the world standings – only the top 15 on the money list in each event play for the biggest prize money in the game. “It was pretty darn close to where I had to quit rodeoing,” Duvall said. “When you’re broke, it just makes me want to try harder. I know if I don’t do good or find a way to make money rodeoing, it’s going home and getting a job. I know that’s probably inevitable at some point, but I don’t want to do it right now. That’s why he set the goal to stay on the rodeo trail through the end of the regular season on Sept. 30. Some cowboys realize their chances to make the NFR are dashed by late July, so they pack up their gear and return home until they can afford to hit the road again. 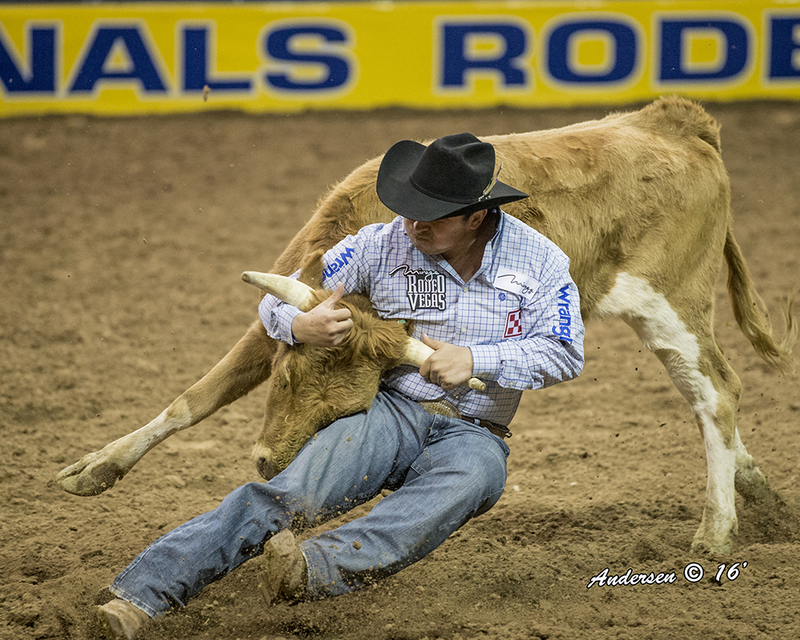 Duvall found a way to cash in and earn his way to his second NFR in three years. He is a two-time winner of the year-end title in the Prairie Circuit, which is made up of rodeos in the Oklahoma-Kansas-Nebraska region. He’s a three-time winner of the Prairie Circuit Finals average championship, and his most recent twin titles in the region came in October, when he utilized the average win in Duncan, Okla., to win the year-end title again. “That was a tough bulldogging,” he said of the regional championship. “I think there were four NFR qualifiers from this year in that field and eight NFR qualifiers altogether. It was my last rodeo of the year. To go out like that puts a cherry on my fall and really gives me momentum heading into Vegas. Although Duvall is 12th out of 15 men competing for the Montana Silversmiths gold buckle. He trails the leader, Canadian Curtis Cassidy, by about $28,000; Duvall can make up that ground by the second round in Las Vegas. “The last time I was at the NFR, it took me six rounds to figure out how fast the start was,” said Duvall, who credits much of his support to his sponsors, Wrangler, Purina, Stierwalt Superflex, Cowhorse Supply and the Mirage. “This year I’m going to try to win the first round. Of course, my main goal is to try to place every night. I gave everyone a head start last time. While in Vegas, he will ride a horse owned by fellow steer wrestler Darrell Petry, who will serve as hazer, helping Duvall keep the steer running in a direct path to provide the steer wrestler with the best opportunity. Of course, there’s no greater support than what he has at home. It’s not just a family of bulldoggers that supports him; Duvall has a strong cast of characters with his wife, Megan, and their 3-year-old daughter, Chaney. “Megan does a great job raising our child, and she’ll do anything I need,” he said, explaining that his wife was opening gates and videoing runs on a recent practice that took place in near-freezing temperatures. “She also motivates me. She was a five-time state champion in volleyball and basketball in high school, so she has a winner’s mentality. Being on the rodeo trail means Riley Duvall is living his dreams chasing that elusive Montana Silversmiths gold buckle. It also means months away from the ones he loves the most. When he returns at the conclusion of ProRodeo’s grand finale, he hopes to be sporting the 2018 world champion’s gold buckle.